Shark Week reminds us that sharks aren’t the monsters of our nightmares and although these are apex predators, a greater evil may be lurking in the deep… plastics! This year marks the 30th anniversary of Shark Week, which is the week the majority of us are reminded of how cool sharks are. Despite some of the “crazier” shows that run during this block (including this year’s episode of “Naked & Afraid of Sharks”) and the letdowns (*AHEM* the fact that Michael Phelps didn’t ACTUALLY swim with a shark last year!! ), I’m a pretty loyal viewer of the program. One of my favorite programs of this year was the special episode of “Shark Tank” where the Sharks (the people… not the sea creatures) pitched their ideas to each other to win $50k to their chosen shark conservation organization. Some of the figures that stood out to me were that while sharks kill 6 people a year, people kill 1,000 sharks an hour (Daymond John) and that between 70-100 million sharks are killed each year from finning (Mark Cuban). In more recent years, consumers have been made more aware of the damaging effects that plastics have on the ocean, so much so that cities (such as Seattle and NYC) and corporations (such as Starbucks and Disney) have been outright banning things such as plastic straws. As an avid straw-user myself, I’ve recently made the switch to reusable stainless steel straws, which are not only surprisingly affordable, but they make it seem like your drinks are extra cold and they cut down on plastic waste. If you’ve been paying attention to all this plastic talk, a buzzword you might have heard is “microplastics,” a term that refers to “those that are less than five millimeters in length.” Plastic microbeads, such as those commonly found in exfoliating products, are considered microplastics and were banned by former President Obama in 2015 in the Microbead-Free Waters Act of 2015. When it comes to sharks specifically, The Guardian reports that a study has shown that some sharks and even whales and rays are increasingly at risk from microplastics due to the way they feed by filtering for plankton in the ocean, causing them to accidentally ingest indigestible plastics. 4. USE REUSABLE PLASTIC PRODUCTS. The concept of the shampoo bar isn’t exactly new to me – I’ve been using Lush’s shampoo bars on and off for a few years now (they’re great for travel! ), and to me, they were the OG. I’m not sure if I’ve just become more aware of this kind of product now or if more companies have caught onto it (or maybe both), but I feel like there are tons of brands producing shampoo bars, and Amazon actually has a pretty large selection. One of the more interesting ones I found is by the company The Yellow Bird – not only is the product itself zero-waste by nature, but the box it comes in is also recyclable. Plus, at $9.50 on Amazon, this costs slightly less than the Lush alternative and if you have Prime, you get free two-day shipping. Win-win, IMO. Unlike most moisturizers that come in plastic bottles, essential oils come in glass packaging (with the exception of the top), which is generally much easier to recycle. I myself use rosehip seed oil as a nighttime moisturizer instead of a more “traditional” night cream due to its many benefits, including evening out skin tone and fading scars. Microbeads are so 2015, and sugar/salt scrubs are not only better for the environment, but they’re cheap and easy to make yourself. According to Happi, when it comes to your face, you should probably stick to using sugar due to the fact that the granules are rounder and are less likely to tear the skin. Furthermore, sugar granules dissolve more easily making them less abrasive than salt, are better suited for most skin types and conditions due to the gentler nature, and the glycolic acid content of sugar helps to protect skin against harmful toxins. Salt is still a good option when it comes the body, especially areas such as feet and elbows where there is more dead skin. If you might not have noticed, it’s best to avoid plastic when you can. One of the reasons why I like my nightly rosehip seed oil is that it comes in a glass bottle that can either be recycled or reused more easily than its plastic counterpart. If this otter can do it, so can you!! You might have noticed I keep saying plastic is “more difficult to recycle,” and that’s because it really is! I know I also keep mentioning my own post about recycling makeup, but it’s because in researching for that post, I learned a lot about the right way and the wrong way to recycle. There are seven “numbers” when it comes to plastic, and not all of them can be recycled. In fact, if you throw a number that can’t be recycled into the bin, you run the risk of contaminating the whole thing. In general, #1 and #2 can be recycled, while #4 and #5 can often be recyclable, but not always. …again, not to toot my own horn, but you should really check out my recycling post for more info on all this! Basically, sharks are cool, and while Shark Week gets us (understandably) hyped, we should be making an effort year-round to try to protect our oceans, which are being polluted by plastics and microplastics. One of the more simple ways to do this is to cut down on the amount of plastic we use in our beauty routines as personal care and beauty products account for a third of all landfill waste and that we discard our own weight in packaging every 30-40 days. One way to do this is to ditch packaging altogether, such as in the case of shampoo bars. Other alternatives include going the glass route. In cases where avoiding plastics isn’t possible, try to recycle as responsibly as you can, making sure to check what numbers your plastics are and if your local recycling facilities accept them. It may be worth it for you to also check out companies that have recycling programs in place, or companies that do refillable products to minimize as much waste as possible. I just want to reiterate that I am in no way a zero-waster, but I have slowly been trying to incorporate less wasteful products in my routine bit-by-bit in order to minimize my own footprint on the environment. In my eyes, even the smallest thing helps, and the whole thing reiterates the idea of eliminating plastic straws mentioned in Business Insider as environmentalists say letting go of a single piece of plastic could be a first step in a much-needed larger behavior change. Plus… what would Shaq do? 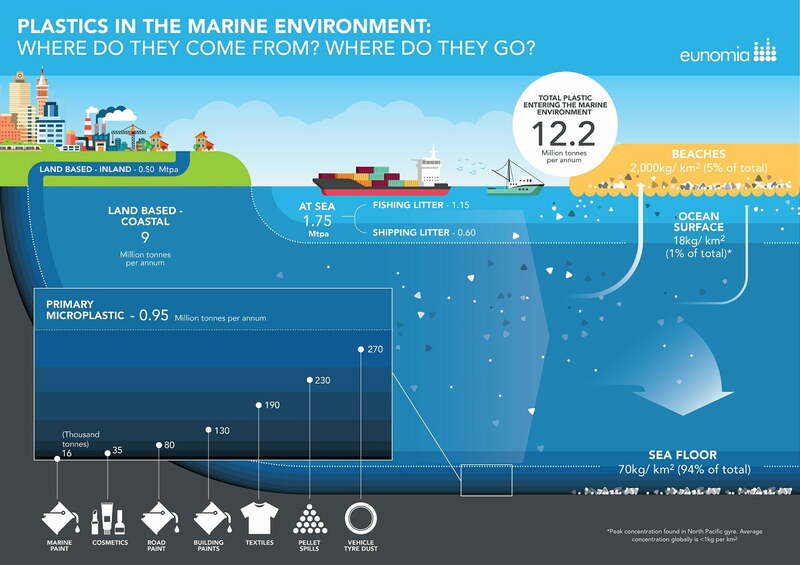 National Ocean Service // What are microplastics? tricks & trucco (*wink wink*) // How to Recycle Your Makeup! Genericide in Beauty: Is “Beautyblender” the “Scotch Tape” of the Industry?